All commodities do not have the same volume. Some may weigh less but have a larger volume. Take for instance 1 ton of steel as compared to 1 ton of cotton. The latter will occupy more space than the former. Here, the volume of cotton is much higher than that of steel, even though it weighs the same and will require more space on the carrier. If the airfreight charges are levied according to weight of the cargo alone; both packages will be charged the same, irrespective of the fact that the cotton cargo is inadvertently occupying a lot more space. If you consider this factor you will understand the significance of chargeable weight and why it becomes important to consider actual weight and volume of cargo. 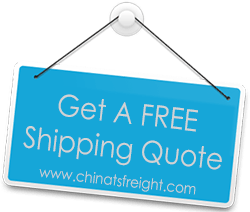 For calculating dimensional weight the exact dimensions of the cargo packages are required. That is the length x breadth x height. If the measurements are taken in centimeters, then the formula for calculation will be (length x breadth x height) cm3 divided by 6,000. If the measurements are in meters then the formula that is applied for calculation will be length x breadth x height CBM (cubic meters) divided by 0.006. Air carriers use above calculations to determine whether to charge air freight based on gross weight or dimensional weight. Remember, the freight rate is based on which of the two is higher, which we call chargeable weight. 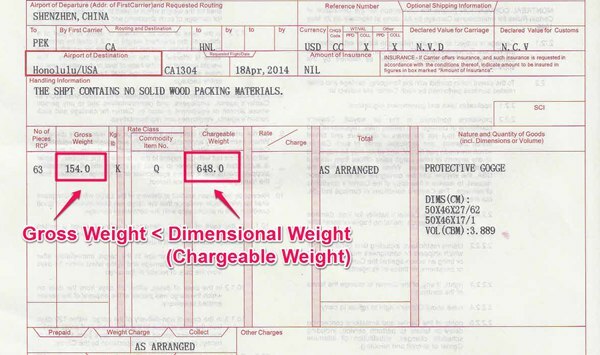 In this example the gross weight of the shipment is 154kgs and the dimensional weight is 648kgs. Since the dimensional weight is greater than the gross weight of the cargo the air freight will be levied for the dimensional weight, 648kgs becomes the chargeable weight. Irrespective of which system is used for calculation of volume and weight the net results are always the same. It does not make a difference whether you are using kgs and lbs for calculating weight and inches/meters/centimeters for volume.